Easily organize transportation to the Women's March on Washington this upcoming January. GOGO Charters is here to support your protest by getting your group around D.C. or other cities participating in impactful sister marches. Call us today at 1-855-826-6770 to learn more! GOGO Charters is proud to express continued support of the monumental Women’s March, scheduled for the beginning of 2019. During the second iteration of the Women’s March on Washington in 2018, GOGO Charters’ parent company, Shofur, set aside over 4,500 buses to shuttle participants to this historic event. For each charter bus rented in preparation for the 2018 March, Shofur donated $150 to the customers’ choice of charity, including AAUW, Global Fund for Women, and Planned Parenthood. In 2019, GOGO Charters continued its parent company’s legacy by donating $150 to Women’s March National for every bus rented for this momentous occasion in Washington DC. Charter buses were dispatched from across the country for groups of empowered women and supporters to travel the distance to Washington D.C. Our services also spanned to support protesters organizing and traveling to local sister marches in locations like Boston, Salt Lake City, New York City, and Philadelphia. 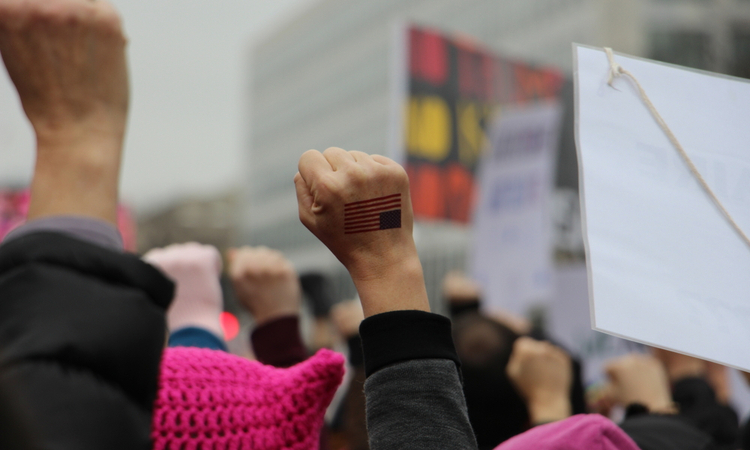 At the next Women's March on Washington, participants can rely on GOGO Charters and Shofur for transportation once more. Our company will handle the travel logistics so protestors can keep their mind on the task at hand: causing a #WomensWave this year. The primary gathering location for the Women’s March on Washington is typically on the National Mall at 12th Street and National Mall. Gathering usually begins at 10:00am and the march usually starts at 11:00am. The rally, following the 2.3 mile march, is held at the Constitution Gardens beginning at 1:30. As a company, we stand in full solidarity with all women participating in the Women’s March in our nation’s capital and those trying to better the world through social change. Transportation has played a crucial role in the development of activism, and GOGO Charters is here to support these important endeavors. We aim to further help protestors fulfill their mission of peaceful protest by offering some of the highest quality transportation services in the nation. Availability for buses to the Women’s March and national sister marches varies by location. We recommend reserving your bus as soon as possible to ensure the most affordable prices and vehicle model accessibility. Once your charter bus is booked for the event, be sure to RSVP your group with Women’s March National to receive important pickup and drop-off information. Groups attending sister marches throughout the nation should request additional information from hosts regarding transportation arrangements. Historically, the areas around marches have been congested and difficult for vehicles to navigate through. Similar to last year’s march, we would highly recommend using a charter bus to shuttle everyone to a train station in order to take the train into the center of the march. A charter bus will not only aid in the organization and arrival of protestors, but group transportation will help alleviate some traffic stressors in the surrounding area. Booking your charter bus for the Women’s March on Washington is easy and simple. Call our offices today at 1-855-826-6770 to get the process started. We’re here 24/7 to support your cause!